WANT TO COPE BETTER WITH STRESS AND TENSION? Do you struggle with insomnia, headaches, chronic pain, anxiety, depression, anger, irritability or feeling overwhelmed? Are you tired of living with aches and pains and missing out on things you used to enjoy doing? Would you like to remember how to relax and feel calmer and more peaceful? Founded by Dr. David Berceli, TRE® (Stress, Tension and Trauma Release Exercises) activates the body’s instinctive tremor mechanism in a safe and controlled way. These tremors release the tension that builds up in our bodies because of everyday stressors and challenging life events. If you’ve already done TRE® training and want to refresh your skills and deepen your learning, please see the FAQs below for information about reattendance at the 3-day workshop. 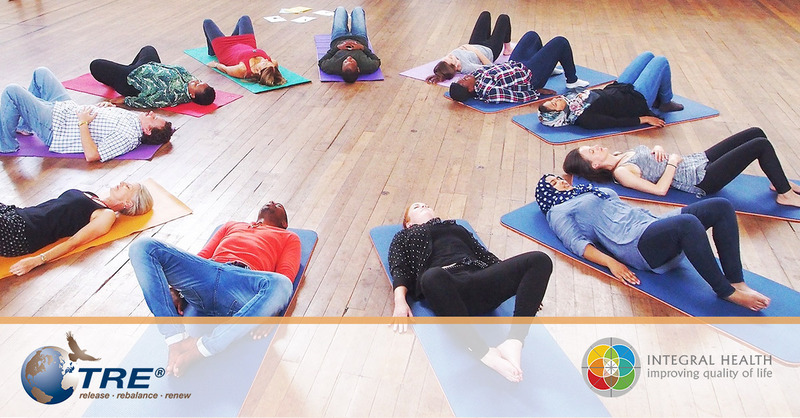 Led by international TRE® Certification Trainer Ingrid Regenass, this 3-day experiential workshop is perfect if you want to learn about and practice a technique you can use for your own health, healing and self-care. It is also the first step in the TRE® Global Certification Training Programme (GCTP) for those who want to learn how to use TRE® in a therapeutic or healing context to help others release stress, tension and trauma. This practical workshop covers the basic theory of TRE® and includes several opportunities to practice TRE®. It will help you develop the skills you need to manage your own stress better. TRE® is effective as a stand-alone practice and also enhances other stress relief practices such as mindfulness, yoga and meditation. This 3-day workshop is open to the general public and is ideal for anyone who wants to learn a valuable self-care technique that can be used to manage stress and tension for the rest of their lives. TRE® promotes inner peace and well-being and helps to increase resilience to life’s inevitable challenging events. TRE® can also be used by professionals whose work supports those affected by stress, tension, anxiety and trauma and who want to add a body-based, self-empowering technique to their existing services. This includes therapists, counsellors, social workers, occupational therapists, osteopaths, physiotherapists, doctors, chiropractors, craniosacral therapists, bodyworkers, coaches, parents, teachers, fitness instructors and others in alternative health fields. Those who wish to teach TRE® to others or use it as a therapeutic technique will need to certify as TRE® Providers. This requires completion of the full TRE® Global Certification Training Programme (GCTP). Attending the 3-day Exploring TRE® workshop does not equip you with the skills and competencies required or qualify you to teach TRE® to others. Ingrid Regenass is a global TRE® Certification Trainer and mindfulness-based Integral Health practitioner in Cape Town, South Africa. She is a Registered Nurse with additional qualifications in Fitness Training, Life Coaching, Counselling, Clinical Nutrition, and Mindfulness-Based Interventions. Ingrid has over 30 years of experience in the field of health promotion and wellness and a wealth of knowledge about delivering TRE® in a range of settings. She works with TRE® clients and providers all over the world. This is the last TRE® workshop that Ingrid will be facilitating this year, so make sure you take advantage of this unique opportunity to learn from her. READY TO SIGN UP FOR THE WORKSHOP? Book by 21 June for a great deal! If you’ve already done TRE training and want to refresh your skills and deepen your learning, please see the FAQs below for information about reattendance at the 3-day workshop. We’ll ask you to complete an application form to tell us a bit about you, your objectives and circumstances. We’ll set up an online interview so you can meet Ingrid and confirm the workshop is a good fit for you. We’ll confirm the payment details and ask you to make payment for your workshop place. We’ll send you full joining instructions and look forward to sharing TRE with you.